This case study illustrates recent developments in synthetic biology that could impact the $35 billion natural rubber market and disrupt the livelihoods of producers. These developments impact the sustainable use of biodiversity and fair and equitable sharing of benefits from the genetic resources associated with rubber production. 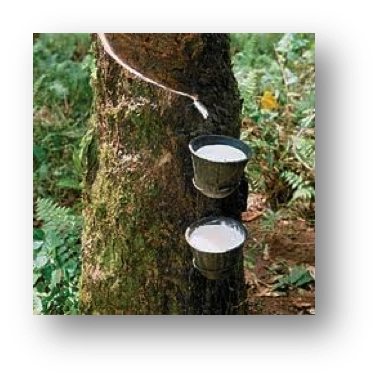 Natural rubber has already lost half of its market to petroleum-based synthetics. If production challenges are resolved, production via synthetic biology could erode the remaining half. Using synthetic biology, three different commercial teams are working to produce a biosynthetic isoprene that could soon impact Asia’s exporters; other companies are producing biosynthetic butadiene and isobutene, also crucial to the manufacture of rubber. Today, more than 60 percent of all natural rubber is used for tires with replacement tires accounting for the majority. Rubber is just one of hundreds of economically important natural plant compounds whose production may be switched to synthetic biology production in a very short time frame. No inter-governmental body is addressing the potential impacts of synthetic biology on the conservation and use of biodiversity and on the livelihoods of those who depend on agricultural export commodities (including high-value flavors, fragrances, essential oils, etc). The Convention on Biological Diversity is the most appropriate forum to address this new and emerging issue.